One of the classic images of the Old West is that of the gnarled, grubby gold miner trudging through the creek-beds, canyons, and mountain passes with his trusty, heavy-laden donkey by his side. Miners didn’t use horses because they didn’t tolerate the heat as well as donkeys, and horses were not sure footed enough to travel the rough terrain, the narrow, winding trails, and the slippery stones along the river beds. Today, tourists can relive some of the experience of donkey travel when they sign up to take the trail ride down into the base of the Grand Canyon. Actually, they use mules on the trail rides. A mule is the offspring of a male donkey and a female horse. From what I’ve read, mules have a more pleasant demeanor which is why trails rides use them instead of donkeys. Otherwise, a mule is similar to a donkey. The stories I’ve read from people who have taken the Grand Canyon trail ride tells about their horror at how close to the steep edges of the canyon trail the mule will walk. Instead of hugging the wall along the cliff, the mules often times walk right along the very edge of the cliff, their passengers hanging on for dear life. Donkeys, and their cousins, mules, are sure-footed, hard-working animals, able to carry heavy loads, and to endure adverse conditions, and to traverse difficult terrain. Keep that image in mind. We will come back to it. In our gospel reading this morning, we hear the story of Jesus’ entrance into Jerusalem. At first glance, this is like the Waseca Marching Classic. The Waseca Marching Band comes down the street and the crowd goes wild with applause and shouts. In a similar way, Jesus is seen coming down the street, and the crowd goes wild with their shouts of hosannas and praises. All the people around Jesus are supportive. For once, there are no detractors in the crowd. People appear excited about his presence. To be sure, their shouts indicate that there was still a misunderstanding about his true identity – he’s called by the crowds “Son of David,” and, “the one who comes in the name of the Lord.” They still expect a military Messiah who will defeat the Romans, and restore the nation. But over against all the hoopla and hosannas, the gospel writer is careful to emphasize a contrasting note in this celebratory theme. 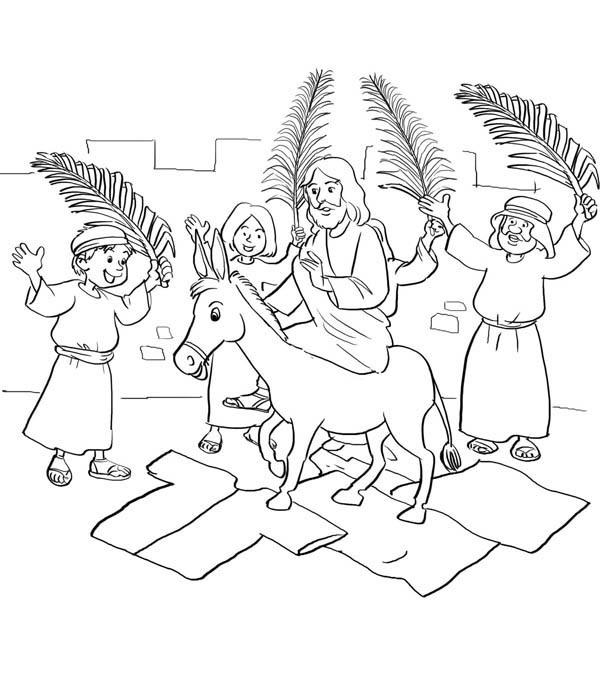 Jesus instructs two disciples to get for him a young donkey colt, and so that there is no misunderstanding of the identity of this animal, that the people would suppose that this colt was some young, noble, high-spirited horse, Jesus tells them to bring the colt’s mother, also a donkey. We are to read this like an acted-out parable. Matthew wants his readers, and us, to note the incongruity, the contrast, between the crowd’s shouts, the royal parade, and the humble, simple beast of burden upon which Jesus rode. It’s like that Sesame Street song, “One of these things is not like the others.” It’s the donkey that doesn’t fit into the crowd’s expectations and celebration. In that day, donkeys were used for work. Donkeys were the common pack animals used by hard working laborers and merchants. Donkeys were unimpressive animals. There were not what you rode if you were an important person, a military leader, a king, or a person of power or rank. However, the donkey is clearly Jesus’ own choice for his entrance into Jerusalem. Riding on that donkey, Jesus fulfilled the prophecy of Zechariah in the Old Testament which says, “Look, your king is coming to you, humble, and mounted on a donkey.” (Matthew 21:5) Jesus was King, but he was unlike any king that the people knew, because Jesus was also a humble servant. The back of a donkey doesn’t put one up above the heads of others. In fact, sitting on the short-legged animal puts the rider at a face-to-face level with a standing crowd. Jesus couldn’t ride head and shoulders above the crowd, nor did he want to. Jesus was a king, but he didn’t come to stand above people, he came to stand with them as a servant, helper, and friend. I can imagine a Roman officer on horseback, watching this parade from a hilltop, ready to quell this demonstration with his savage efficiency if it got out of hand. He must have regarded Jesus’ entry on a donkey with contempt. Perhaps he thought: “Ah, back in Rome they know how to stage parades to honor someone great. There the conquering general rides in a chariot of gold, with wheel spikes flashing in the sunlight, pulled by proud stallions. Behind him, officers in polished armor display the banners captured from the defeated armies. At the rear comes the ragtag procession of prisoners in chains, hanging their heads in humiliation, living proof of what happens to those who defy Rome. Now that’s what a parade should look like. Jesus, the Son of God, took on our human form, became one of us, and gave himself completely for others in love, even to the point of giving his own life. And we, as his followers, his body in the world today, are given the mission to have that same mind, and to carry his name, his message, and his love into the world. So, if that’s our mission, to carry Christ into the world, then each of us is called to be a donkey. There’s no glory in being a donkey. We would like life to be easy. We would like the Lord to smooth the way for us and to remove any difficulties from our lives. We would like the Lord to rescue us from any hardship or suffering. We would like the road we travel in life to be paved with gold. But the Lord calls us to the hard task of serving, helping, and giving. Along the way, there will be long trails, steep roads, heavy loads, and little or no recognition for a completed job. In Jesus’ case it meant suffering, apparent failure, and death. So I send you home today with a question: Will you be a donkey, to care Christ, his name, his message, and his love into the world? Will you walk the difficult road of suffering and hardship, in love, for the sake of others? Karl Barth, a Biblical scholar from the 20th Century whose books influenced many Seminary students and pastors, offered this testimony at his 80th birthday party: “In the Bible there’s talk of a donkey. It was allowed to carry Jesus to Jerusalem. If I have achieved anything in this life, then I did so as a relative of that donkey who at that time was going his way carrying an important burden. The disciples had said to its owner: ‘The Lord has need of it.’ And so it seems to have pleased God, my Lord, to have had some need of me and to have used me in my life, to be the donkey which was allowed to carry our Lord Jesus into the world. Will you be a donkey and bear Christ to the world?